Over the past weeks, the number of WhatsApp groups I belong to has increased geometrically. Most of the groups I have had to join recently have been due to an unavoidable necessity. And in some of these groups, I have had to be one of the group administrators for various reasons. I must confess, It has been quite an experience: Good, bad and ugly. I have come to observe that different people join different groups (WhatsApp groups majorly) for different reasons and most importantly without considering the fundamentals that birth most of these groups. Within permissible limits of presumption, I want to believe that a high percentage of users, especially in the older teenage and early youthful stage, join most groups in search of adventure and amusement without any real connection to the main purpose of the establishment of the group. The aftereffect of this is not far-fetched; it's loads and loads of irrelevant chats, annoying spam and unnecessary “Send To 7 People or die” messages. The Senate of Obafemi Awolowo University has today resolved to pick August 7 as the date for resumption of students. After the over hundred days holiday, the resumption dates for students of the Obafemi Awolowo University, Ile-Ife have finally been announced. Confirming our earlier report, the returning students of the institution have been directed to resume On the 7th August, 2016 while the Fresh students are to resume on the 3rd of August to complete their various registration processes. Lectures commence on the 8th August, 2016. We wish all students a happy resumption. Barely two days after the Acting Vice-Chancellor of the Obafemi Awolowo University, Ile-Ife, Professor Anthony Elujoba, paid a visit to the various Halls of of Residence on Campus with his entourage, repair works have commenced in several of these halls. Speaking with our correspondent, some workers who came around claimed they were around for inspection and estimation needed for the renovation as their work would commence anytime from now. As at the time of filing this report, the repair of doors in Awolowo Hall Block 3 and renovation of toilets has commenced. Electricity supply has also been restored to all Halls of Residence on Campus. This comes as a surprise to majority of the students who have continued to complained over the years about the de-humanizing state of the University Halls of Residence. Clearly, this is a strong indication in the positive direction for the Institution considering the current Acting Vice-Chancellor has only spent about three days in office. Earlier today, the newly appointed Acting Vice Chancellor of Obafemi Awolowo University, Professor Anthony Elujoba, was on an inspection tour of all halls of residence on the University's campus. The Acting VC's check on the state of the halls is believed to be in a bid to assess the current situation of things with a view to proper improvement. Halls of residence visited include: The Angola Hall, Mozambique Hall, the Muritala Muhammed Postgraduate Hall and the Obafemi Awolowo Hall, where he was said to have personally observed the sardonic state of the toilets in the Halls. In the company of Professor Elujoba was the University's Registrar; Mr D.O Awoyemi, the School PRO, Mr Abiodun Olanrewaju and the Acting Dean, Division of Student Affairs; Dr(Mrs) L.M Durosinmi. 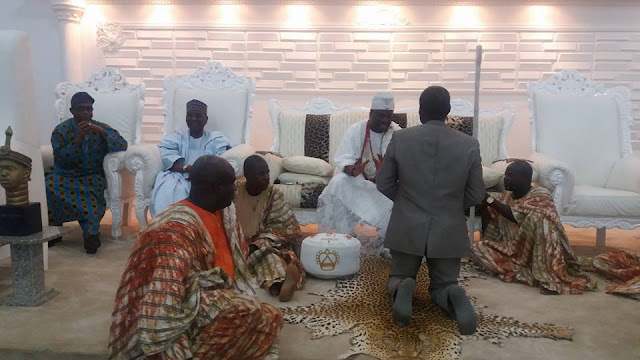 On Tuesday, the Ile-Ife born acting Vice Chancellor of Obafemi Awolowo University, Professor Anthony Elujoba visited and paid homage to the Ooni of Ife, Oba Adeyeye Enitan Babatunde Ogunwusi Ojaja II. According to the newly proposed calendar for the 2015/2016 Academic session. The resumption date for students of the Obafemi Awolowo University, Ile-Ife has been put to the 7th of August, 2016. However, the calendar is still up for final ratification by the University Senate on Thursday, 28th July, 2016. Post-UTME Scrapping; A Panacea Or A Conundrum? It is no longer a news that Post Unified Tertiary Matriculation Examination popularly known as PUTME has been scrapped. It took the intervention of the Federal Government through the office of the Minister of Education, Mallam Adamu Adamu to put an end to the system, a development which is not unconnected to the fact that the process has been viewed by many to have lacked merit and has served as a means through which institutions exploit admission seekers to generate huge income. The School of Health Information Management of the Obafemi Awolowo University Teaching Hospital has invited applications from qualified applicants into its Health Records Officers Registration Board of Nigeria (HRORBN) programme. According to a full page Advert on The Punch Newspaper sponsored by the Institution and duly signed by the Director of Administration and Secretary to the Management Board, completed application forms into Ordinary National Diploma and Higher National Diploma programmes is scheduled to come to an end by Wednesday 3rd August, 2016 while screening comes up on Wednesday 10th August, 2016. The Pre-degree Students of the Centre for Distant Learning, Obafemi Awolowo University, Ife would commence their Second contact examinations tomorrow, Monday, 25th July, 2016. We at OAU Peeps hereby use this medium to wish the students all the best in their exams. The Obafemi Awolowo University has hereby extended her ongoing Screening process indefinitely. According to a post on the portal, the new closing date would be made known on the portal.